While most of the booths there were meant to simply deliver a pitch, maybe accompanied by a minimal visuals, ours was one of the few with an interactive demo—a multiplayer game that attendees could experience with their friends. Our banners also got people’s attention. Not many booths were framed by such large posters, and ours had the advantage of the colorful, punk rock-inspired graphics. On Thursday, we competed in the Baiada Incubator Competition as part of the Startup Fest. Pitted against 24 other teams, we pitched Runaway and Burning Sky Games as a business in front of a small panel of judges. We did not move on to the final round, but we had a great time and learned our strengths and weaknesses in our current business strategy. 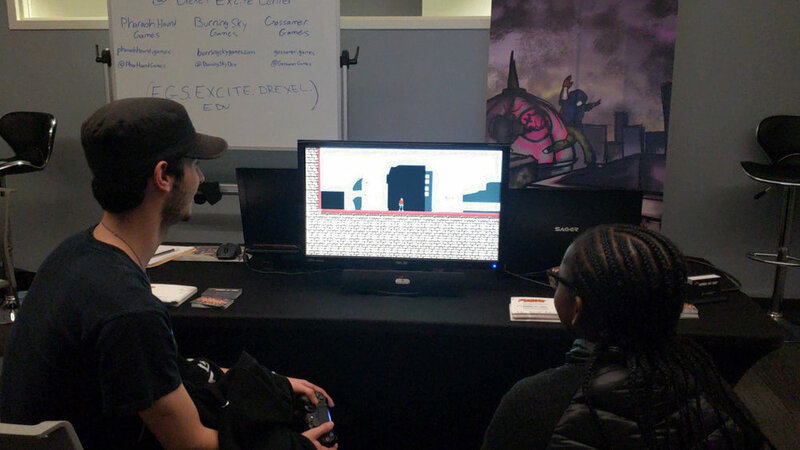 For me, the best part of Drexel Startup Fest was when one guest came over to our booth to check out the game. I asked if she would like to play, but she was hesitant due to her lack of experience with games. I assured her that I wouldn’t judge her for her performance and that any feedback was much appreciated. What really persuaded her though was that I offered to play with her. The multiplayer demo is framed as a race, but we did not play it as one. I took the opportunity to show her some of my favorite maneuvers in the game. I showed her how to do each of them one at a time, walking her through each step. She didn’t have much faith in herself, but she did it! I could tell she was enjoying herself, and I know I was too. To me, it was the best tutorial experience that a game could have: one in which the player learns from another real person sitting beside them instead of from some scripted, coded sequence. Runaway helped assure a young gamer of her video game skills, and it was a the best feeling a game developer could have. Only a day after Startup Fest ended, we took Runaway to the grand opening of CICPhilly, an entrepreneurial coworking space in Philly’s University City. We shared a room with two other Entrepreneurial Game Studio companies: Gossamer Games and Pharaoh Hound Games. Our games complemented each other well: Sole a peaceful, atmospheric adventure; Sons of Ra an intense but slow-burning competitive tower-defense; and Runaway a fast-paced parkour platformer. We met a wide array of guests of all ages, backgrounds, and interests. We gathered feedback on the changes we had made for Startup Fest and even came up with ideas for new multiplayer modes (freeze-tag anyone?) But what stood out most was, yet again, an opportunity to play the game I’ve been working on for so long with someone else. In the above picture, I’m just sitting down to play with a young girl who had dedicated 15 minutes to completing one level. I could tell she had gotten frustrated by one obstacle, but she persisted as another onlooker and I encouraged and coached her through it. I was honestly surprised at how long she kept at it, ready for her to drop the controller at any moment as she repeated that she could not do it. And yet, she did it as I knew she could. I quickly rewarded her with a happy high-five, and then she challenged me to play with her. We played together, at first under the guise of competition as I had to go easy on her. As much as I hate to do that, it otherwise wouldn’t be fun for either of us because I’ve had a couple years more practice than her. But I soon did as I love to do: make up challenges for myself. I stopped playing the objective and just chased her around trying to spray her. It was fun for me and felt like an authentic game for her; I “won” because I succeeded in my mission to spray her, and she won because she tagged the most targets before the round ended. After that, I asked her my favorite question: “wanna see something cool?” From there, I did exactly as I had done two days earlier at Startup Fest and showed her some of my favorite moves. Finally, her family urged her to leave, and they moved on to the other games in the room. But not before she had spent 25 minutes just playing Runaway. To me, that was the ultimate compliment, that someone could willingly spend so long playing only a few levels of a game I had worked on. I’m not gonna lie, it’s been an exhausting week. But with the great reception Runaway has had, it has also been a very fulfilling one. And it’s not time to rest quite yet! We are excited to announce that we will be showcasing Runaway next at the Music and Games Festival (MAGFest) in January 2019! So keep an eye out for our next blog in December, where we’ll look into a bit of what we’re working on in the lead-up to MAGFest! Thank you for reading, and we’ll see you all then!